The fiat money quantity is comprised of fiat money both in circulation and available for circulation, being parked at the central bank in the form of the reserves of depository institutions. 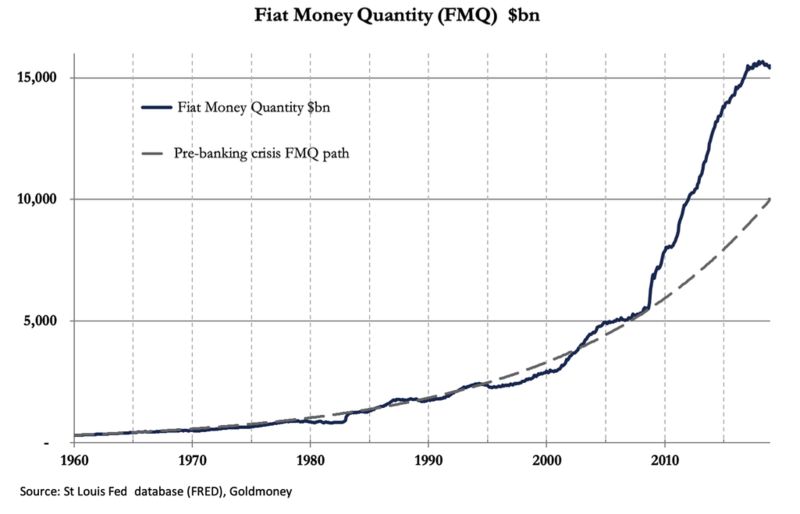 [i] The expansion of US$ FMQ since 1960 is shown in the chart below. It amounted to an accelerated rate of monetary stimulus, and while inflationist commentators are now fretting about the apparent slowdown in monetary growth, it must be admitted that the quantity of fiat money in circulation remains considerably greater than the long-term trend suggests is appropriate. The gap between the two quantities implies there is significant room for the Fed to tighten, and no doubt it was an analysis of this sort that encouraged the Fed to do so last year. The excess reserves component of FMQ began to correct earlier from its peak in August 2014, with the depository institutions’ reserve accounts at the Fed having contracted by over $1,100bn since then. Tapering was first mooted by Ben Bernanke in testimony before Congress in May 2013, but tightening, whereby the Fed sells bonds back to depository institutions while debiting the proceeds from their reserve accounts, only commenced at the start of 2018, three and a half years after peak reserves. The period between peak reserves and peak FMQ (forty-one months to December 2017) saw an increase in FMQ of $2,236bn, a rise of nearly 17% over the period. Clearly, the decrease in bank reserves has increased FMQ by gearing up deposits through commercial bank lending, answering an earlier debate about the long-term consequences of quantitative easing. Shortly after the introduction of QE, on one side were the arch-inflationists who always argued in favor of the state issuing yet more money while being blind to the consequences, and on the other were the practical analysts trying to work out the implications of this new-fangled QE. I recall that when the Fed first initiated QE, and excess reserves rose from zero to a couple of trillion dollars in under five years, there were concerns these reserves would one day be mobilized by the banks to expand credit. Assuming ten-times leverage on a reserve base this implied the next wave of credit expansion could amount to an additional $20 trillion-plus of credit creation, and on-going QE would lead eventually to even greater levels of bank credit being generated. Modern monetary theorists took a different view, arguing that the depository institutions as a whole could not utilize their reserves in this way. An example of the MMT approach is a paper by Paul Sheard, who at the time was Chief Global Economist at Standard and Poor’s. [ii] Professor Sheard argued that the level of bank reserves is not under the control of lending banks, but of the Fed itself. In evidence, he cites an accounting identity, whereby a central bank’s assets must equal the sum of its liabilities, simplified as being bank reserves plus banknotes in circulation plus government deposits. That bit is true as far as it goes. The mistake is in not recognizing the ownership of the reserves. When a bank has excess reserves on deposit at the Fed, it is free to draw them down, and does not, as Professor Sheard stated, have to pass them on to another bank, replace them with physical cash, or lend it to the government so that the right-hand side of his equation still balances with the Fed’s supposedly immovable asset total.